Welcome to Ranch on the Rock Grass-Fed, Grass Finished Beef! Our Mission: Redeem, improve and heal the land, working with nature, using natural methods and raise food the way our Creator intended. Redeem our health and help others redeem theirs. Hi, We are James & Elaine Couch, owner/operators of Ranch on the Rock, home of the finest grass fed, grass finished beef in Northwest Arkansas and Northeast Oklahoma. Our goal is to make delicious, good for you beef affordable for our customers. We strive to deliver you the very best value. What you get from us is healthy, lean, perfectly aged, nothing added to, reasonably priced beef! 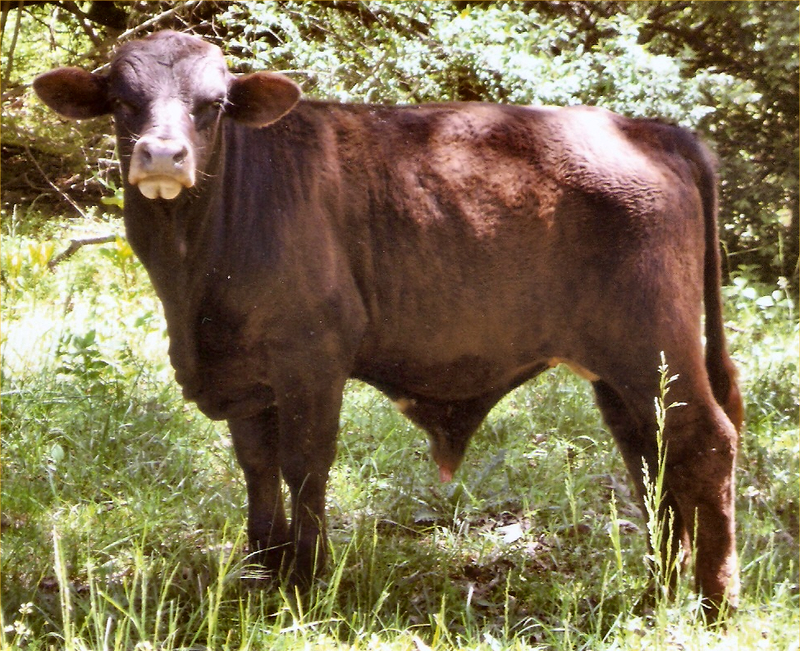 We offer beef from grass fed, grass finished Beefmaster and Angus crosses born and raised on our farm in NW Arkansas. To place an order, you can email us at ranchontherock@gmail.com (preferred) or give us a call or text us at 479-719-0102 and we will schedule your beef with the processor. ! !It can take a while, they stay pretty booked up. They are usually scheduled about 3 months out!! When we take it in we will email you with the tag# and information on how to put in your cutting order and email you an invoice. We can arrange delivery for a nominal fee or you can pick it up at the processor. Feel free to ask us any questions you might have. We enjoy meeting new folks and always appreciate our many repeat customers. We always do the best we can to make sure you get the best beef possible. Get on the list now if you want a quarter, half or whole beef. A huge, heartfelt thanks goes out to our many repeat and new customers for keeping us busy. Here is some information you might not know. Almost all beef you buy in the supermarket is wet aged (aged in the package) which can affect the flavor of the beef. Another little known fact is that 90% of any tenderization resulting from aging occurs in the first 7 to 10 days of aging. The main reason most grain fed beef is aged longer is not to make it more tender, but to try to intensify the bland flavor of the meat. With grass finished beef, the flavor is there to begin with and longer aging is not needed. Our beef is dry aged for 9 to 13 days for perfect flavor and tenderness. Click here for more information on aging beef. On the comparison chart, hover your cursor over the items for more information. Q – Why should I choose grassfed beef over grainfed beef? A – Because studies have shown it is actually good for you. Beef has gotten a bad reputation from the medical press for causing various health problems, but in fact, the real culprit is the method of fattening (finishing) the beef. Grassfed beef is generally leaner, lower in calories and much healthier for you than grainfed. In fact, the fat in grassfed beef is different than the fat in grainfed beef; it’s much lower in the saturated fats linked with heart disease. It is also yellow because it contains a lot more beta carotene. The chart is an abbreviated list of some differences between grassfed and grainfed beef. CLA (conjugated linoleic acid) – has unique fat-burning properties, may lower the risk of diabetes and obesity and inhibit the growth of cancer tumors. Grass-finished meat has been found to be up to 71% higher in CLA than grain finished. Our beef truly shines in the micronutrient profile because at our ranch they eat a wide variety of grasses, sedges, rushes, shrubs, and herbs, each with its own nutrient profile, as opposed to a monoculture grainfed diet comprised mainly of corn and/or soybeans. Q – Okay, I’m convinced it’s good for me, so what exactly is grassfed beef? A – There seems to be some confusion over what the definition of grassfed beef really is. Grassfed and grass finished are not synonymous. Although almost all beef cattle have eaten grass at one time or another, it’s the final fattening phase that makes all the difference in how good the meat will be for you. Even feeding grain for the last thirty to sixty days will cause the resulting meat to lose much of the health benefits of a natural diet of grass. Grain fed beef can be raised to butchering size in about a year, while it takes about two and a half years to properly raise and finish a grass finished beef. Grain finishing can be done any time, but grass finishing can only be done when there is plenty of fresh green grass. It’s also important what kind of grass the beef is finished on. That’s why grass finished beef costs so much more. Be aware that you can buy “grassfed” beef that was grain finished and just because beef is labeled 100% organic or natural or grassfed does not mean it was grass finished. Q – Does grass finished beef taste different than store bought? A – You’d better believe it!. The extra omega 3 and beta carotene will definitely make a difference. That’s the main reason all wild game tastes different than supermarket beef. They have all the good stuff still in them and feedlot beef does not. However, as Mark Schatzker noted in his book, Steak: One Man’s Search for the World’s Tastiest Steak, the best and worst steak he ever ate were both grassfed. (As a side note, the worst just happened to be Angus). It is a combination of the breed, age and how the beef was raised that determines the quality. Almost all people who come from foreign countries where beef is raised and finished on grass dislike the way our store bought meat tastes. They describe it as mushy and flavorless. Q – How do I cook my grass finished beef? We both grew up on farms and have always loved life in the country. In 2006 we traded in two houses and 33 acres for a 211 acre rundown ranch in northeastern Oklahoma. After many years of hard work, many miles of barbed wire fence and a lot of blood, sweat and tears we turned that rundown ranch into a beautiful, productive operation. We will never forget and will always be thankful to the friends and loved ones who helped us through those years. We bless you all. We had a lot of good times and success in those years but eventually we decided that because of our age and health we needed to downsize somewhat. After a lot of looking and a lot of praying we moved our operation to what we feel is the perfect place to slow down a bit. We now operate a 40 acre farm in Maysville, Arkansas. To keep us company, we have three dogs. A Great Pyrenees livestock guard dog, a Blue Heeler, who is always looking for something to do and a very laid back, good natured Beagle/Lab mix. Currently we raise grassfed, free range Beefmaster and Beefmaster cross cattle. We always treat our animals humanely and never use steroids, hormones or implants. The only time we use antibiotics is when it is a matter of life or death for the animal. We are extremely pleased with the quality of calves we are producing. We’re proud of our herds and would love to have you to come visit us and let us show you around (but please call first, we might be busy). We are located three miles south of the Maysville store. Grassfed Beef is actually good for you! Ranch on the Rock Premium Grassfed Beef, Proudly powered by WordPress.